If you listen to Owl City's songs Dental Care and Rugs From Me To You, you'll know that he loves puns and other such wordplays. He also is on Twitter. So it was that I came up with a clever pun and tweeted it to him. 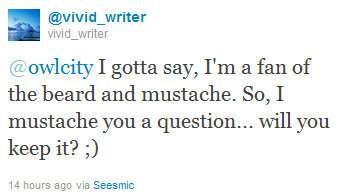 (I must say that the mustache bit isn't original, but it's still funny.) I got off shortly after and honestly didn't think anything would come of it. (@vivid_writer is my public account I use to reply to people who aren't following me. However, something did come of it. I got on after my mom and I finished watching Dr. Quinn and absentmindedly checked my Twitter, only to see a tweet from Owl City. He didn't reply to me, but he tweeted this to EVERYONE. Somewhere along the line, he must have read my tweet. I refuse to believe that this is coincidental. Thank you, Owl City. You made my day. PS the comment moderation that I have to type is "thing." They're running out of made up words. Ha! That's classic. X) I am also a fan of cheesy puns... so, when I saw that you RT'd that, I got a nice chuckle. Makes it even better to know it was (probably...no, DEFINITELY) inspired by you! ;) Good plan, not accepting this as coincidence. heehee.